Clinton emails to be released just before Iowa, New Hampshire; Consumer groups say YouTube Kids has inappropriate content; FIFA investigating journalist arrests in Qatar. 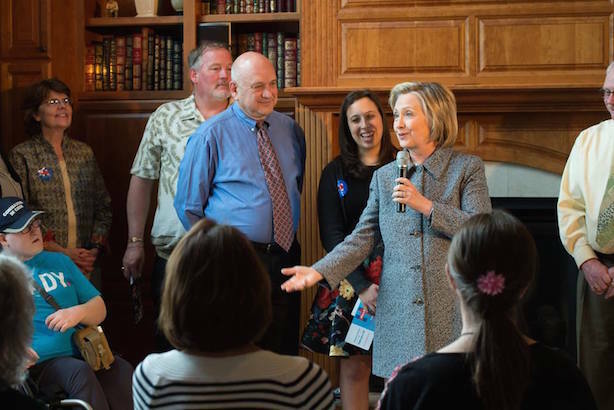 Clinton chats with supporters in Iowa. (Image via Clinton's Facebook page). 1. The State Department said late Monday that it will release the bulk of Hillary Clinton’s emails from her tenure as secretary of state early next year, just before the first-in-the-nation Democratic primary and caucuses in New Hampshire and Iowa, respectively. Clinton, who has easily the highest name recognition among all candidates in the race (or thinking about it), is again facing criticism by Republicans for taking only a baker’s dozen of questions from the press in the more than a month since she entered the race. 2. Two consumer advocacy groups filed a complaint with the Federal Trade Commission on Tuesday morning, claiming YouTube Kids, rolled out in February, has inappropriate content for children. The Campaign for a Commercial-Free Childhood and the Center for Digital Democracy said they found explicit sexual language and pedophilia jokes on the portal. 3. FIFA, the group that oversees international soccer, is investigating why a team of BBC journalists was arrested and imprisoned for reporting on working conditions on Qatar earlier this month. The country has been criticized for employing armies of migrant workers to build stadiums for the 2022 World Cup. The International Trade Union Confederation wants World Cup sponsors such as McDonald’s, Budweiser, and Visa to speak out on working conditions in the country. 4. Drivers aren’t just texting while driving; they’re taking selfies, tweeting, and shooting video, according to a study released Tuesday morning by AT&T. The report is the latest part of the wireless provider’s It Can Wait public service campaign. 5. Former players have accused the University of Illinois women’s basketball program and its coaching staff of misdiagnosing injuries and verbally abusing players, including the use of racially insensitive language. One assistant coach has already left the school. 6. Technology-sector executives are urging college graduates to take on society’s problems in graduation speeches this spring. Apple CEO Tim Cook told the graduating class of George Washington University how Steve Jobs encouraged him to prioritize his social activism while working for the company.